You may not realize it, but every time you save a PDF in OS X, you’re potentially sharing at least a bit of personal information: your name. This may not be a big issue to you, but for someone whose job is, for example, to anonymously review and comment on manuscripts, it could be a problem. How is your name captured? When you use File -> Print -> Save as PDF, OS X encodes some metadata about the file you’ve just created—including (depending on the program you’re printing from) your name. Anyone I send this file to will be able to see this same information, just by pressing Command-I in Preview. 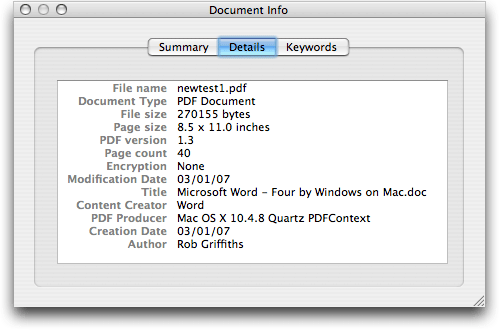 (Other PDF viewers will have similar ways of viewing the PDF’s info; this isn’t just an OS X feature.) If you’d rather not share this personal data with the world, there is a workaround, though it comes with a caveat. Author is now gone, as are Title and Content Creator. If you’re planning on sharing your PDFs, and you’re worried about sending personal data around, then Compress PDF is the better option in the Print dialog box. So what’s the caveat, you might ask? Compare the two screenshots above, and you’ll see that the PDF created with Compress PDF is, very ironically, larger than the one created by Save as PDF—in this case, over 70KB larger. If you print a document that contains many images, the results may be even worse: a web page that was 262KB when printed to PDF in the normal fashion grew to over 500KB when saved with Compress PDF. You’ll have to decide if the extra bandwidth usage is worth the higher level of privacy these “compressed” PDFs provide. You might try further shrinking the PDFs using ColorSync, as described in this article (scroll down to Tip: Use Colorsync To Shrink PDF File Sizes ). 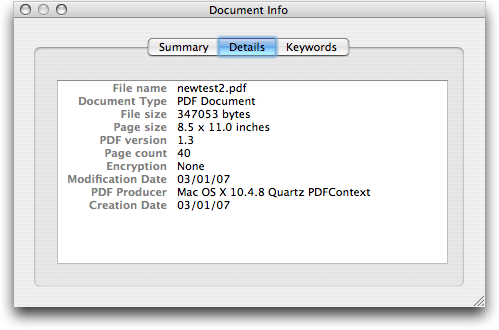 However, in my testing, I couldn’t ever shrink the resulting PDF as small as the Print to PDF version.